Traditionally, German families have their main meal for the day at lunch. 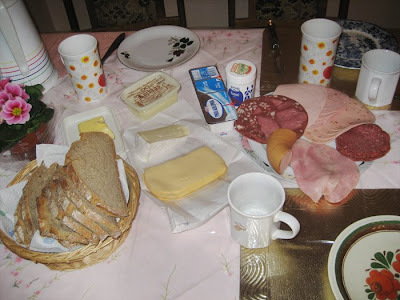 Dinner, or Abendessen, tends to be a simpler affair - for instance, cold cuts and bread. Sounds a tad Spartan, but trust me, it's not. Considering the incredible variety and quality of bread and cold cuts in Germany, you know you are in for a treat. 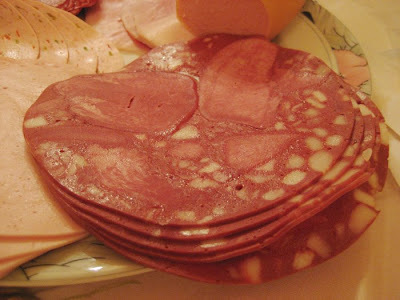 When my awesome host mother would prepare simple and easy mid-week dinners for the whole family, it would inevitably consist of a wide range of hams, salamis, cheeses and breads, with a few cornichons (Gurkens) or peperoncini on the side for good measure. The photo above is of one of the more elaborate versions I enjoyed while staying in Lampertheim. Bread is the all-important base. 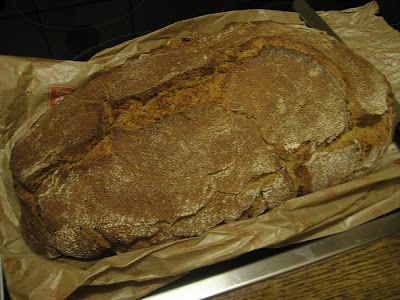 Here we have a loaf of Lampterheimer Brot, from Bäckerei Herweck. The grandma in my host family has been getting her bread from there for over 70 years. It all looks quite meat-heavy and rich, and it is! You'd be surprised how easy it is to eat rather alarming quantities of these tasty, tasty pork products. Bratwurstfilzl / Metwurst. 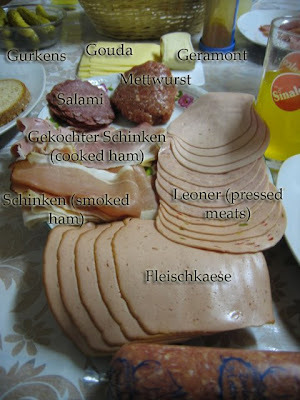 My favourite of all German cold cuts. As I have previously mentioned, it is made of raw bratwurst filling, and absolutely delicious on bread with butter, paprika and thinly sliced onions. In addition to bread, and the usual cheeses, hams and salamis, there was Philly cream cheese, and kochkaese (cooked cheese, see below). Krustebrot. Possibly the best bread I have ever eaten. Check out the awesome electric slicer! I really, really miss German bread. 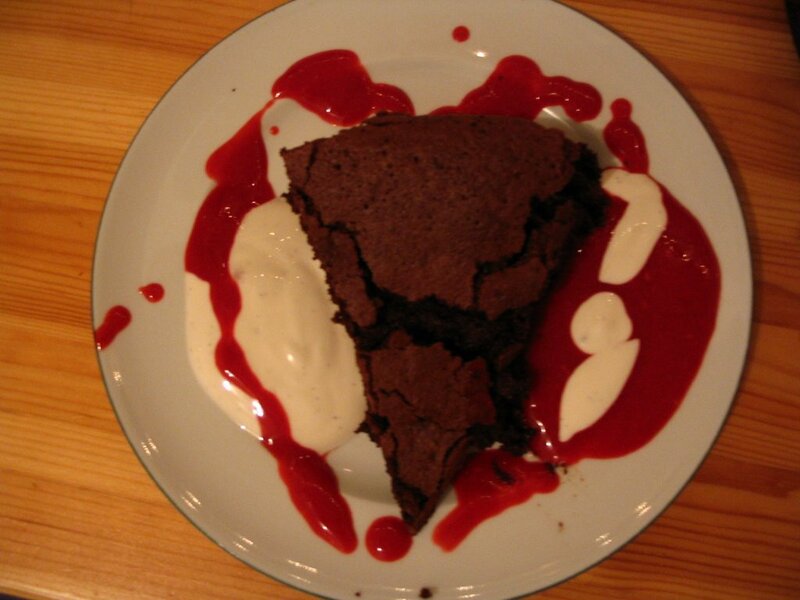 Kochkaese. 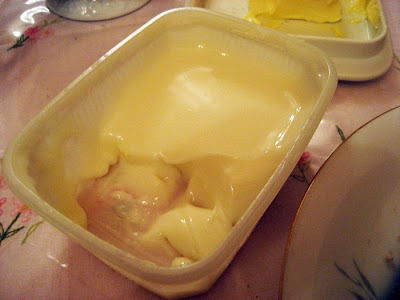 It is a mixture of various fresh cheeses, including quark, which are cooked until appealingly gloopy. Looks like a great lunch! I'm also well impressed with your German, Sarah! 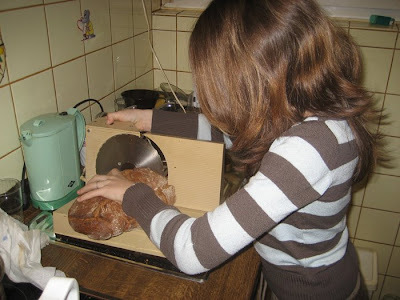 My tante has that same slicer :). 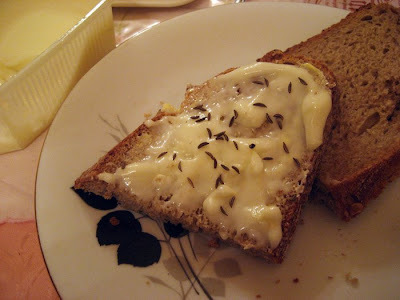 I like the bread toasted & buttered and topped w/a nice slice of cheese for breakfast, too, with hot coffee! Yum! Ahhh, the breadslicer! I remember being *very* impressed with these contraptions when I first went to Germany. Almost bought one in Australia until i realised that, well, most of our bread at the time was so flimsy it'd just be a disaster. Lovely list of bits and pieces here. Ich hab jetzt richtig Hunger! I love mettwurst! With the obligatory raw zwiebeln! You know, what Germans miss most when abroad are beer, of course, and bread! I also was most impressed by the weekend breakfast feast we have at W's mum, especially at the beginning!